2000AD is a British anthology series that features several different stories from different writers and artists in each issue. The company 2000AD has been around for over 40 years and is probably best known for introducing us to the character Judge Dredd and his violent futuristic world. 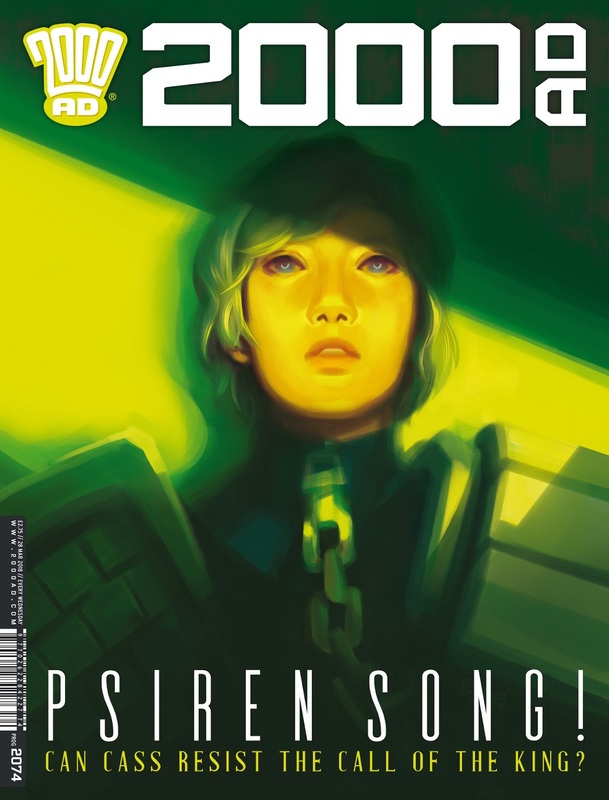 This issue contains five stories that feature Judge Dredd, Jaegir, Sinister Dexter, Anderson, Psi-Division, and Strontium Dog, with a cover from Emily Zeinner. The previous issue featured an all-new set of stories, which made it the perfect jumping on point for new readers. The first story is “Judge Dredd: Fit for Purpose Part 2” and was written by Rob Williams, illustrated by Chris Weston, colored by Dylan Teague, and lettered by Annie Parkhouse. Judge Dredd is called in by the SJS (internal affairs) to testify on SJS Judge Gerhart's worthiness to remain on duty. Gerhart is one of Dredd's oldest allies and we learn more about their back story and why some potentially corrupt SJS Judges are looking to banish Gerhart from Mega-City One. The conclusion of this part definitely has me looking forward to what it set to come for Dredd and Gerha. Weston's drawings have a distinct look that is the 2000AD style, but still slightly resembles the major superhero comics. There is one great action panel and the facial expressions are excellent. The colors from Teague resemble most of the major studio comic books, but it does complement the art well. This is followed by “Jaegir: In the Realm of Pyrrhus Part 2” and was written by Gordon Rennie, art by Simon Coleby, colored by Len O'Grady, and lettered by Ellie De Ville. Jaeger is part of the Nordland State Security Police, sent on a mission with her team to Nu Earth where there is a war going on against Southern forces. In this part, we learn why Jaeger has been sent to Nu Earth. We are also treated to an impressive battle against a tank on Nu Earth. Once again, Coleby's art is terrific, filled with heavy black shading that also features a giant tank that is highly detailed. The colors from O'Grady shift when the narrative shifts in time. On Nu Earth the colors are filled with subdued purples, yellows, blues, and greens, while the scenes from four days earlier have a more traditional look to them. With intense action and the story slowly unfolding, I am looking forward to seeing what happens next. The third story is “Sinister Dexter: Night Class” and was written by Dan Abnett, illustrated by Steve Yeowell, colored by John Charles, and lettered by Ellie de Ville. Sinister Dexter follows Finnigan Sinister and Ramone Dexter, the best hitman in the future city of Downlode. In this episode, Sinister is teaching a night class on gun-sharkery to a group of potential newbie hitmen. The art is very cartoonish, which fits with the dark comedy that comes from these characters and the world that they exist in. I guess you could compare the tone of Sinister Dexter to something like Deadpool, which would appeal to a lot of potential readers. This is followed by “Anderson, Psi-Division: Undertow Part 2” and was written by Emma Beeby, illustrated by David Roach, colored by Jose Villarrubia, and lettered by Simon Bowland. Anderson is the top telepath (seen in the film Dredd) of the Psi-Division and is currently investigating the murder of another psi-Judge with her partner Judge Flowers. In this part, Anderson discovers what entity they are facing and look to recruit several other people with powers to assist her. The art from Roach resembles the style of the Judge Dredd tale, which works since they do exist in the same world. The biggest difference in this story is that there are more horror and supernatural elements, which have become more prominent in part 2. The final story is “Strontium Dog: The Son Part 2” and was written by John Wagner, illustrated by Carlos Ezquerra, and lettered by Ellie de Ville. Set in the future after the Strontium 90 fallout, Strontium Dog is a mutant bounty hunter that works for the Search/Destroy agency. He is sent to Planet Protoz with a new hitman named Kenton, which is having troubles and violence since opening the planet up to aliens. They meet the leaders of Protoz and are presented with a nearly impossible mission. Once again, Strontium Dog is beautifully drawn by the legendary Ezquerra (co-creator of Judge Dredd and Strontium Dog) and the art is just rich in uniqueness and his specific style. If you like sci-fi and futuristic stories then you really need to start reading 2000AD. Now is still a good time to jump in, while the stories have just begun. Grab the previous issue and start reading.